We are experts in the modeling of high temperature gas dynamics, which exhibits non-equilibrium chemical states and resulting radiation. Two applications include rocket exhaust plumes and shock layers surrounding hypersonic vehicles. 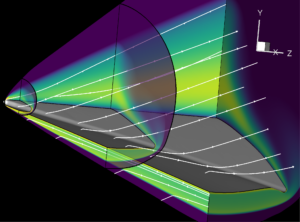 SSI has applied the best available hypersonic flow models, extensively validated throughout academia and industry, and coupled these tools with non-equilibrium gas radiation models for end-to-end prediction of spectral emission. For example, the figure shows the distribution of translational temperature and streamline locations across a Mach 20 wave rider vehicle. Temperature contours and gas streamlines for Mach 20 gas flow at an altitude of 50 km over a hypersonic wave rider.